While Video Poker has been around for many years, many people do not know the rules and how to play these games. This is somewhat complicated by the fact that there are many variations of Video Poker games, some more complex than others. This article shows the rules and how to play the basic game based on the simple draw poker concept. After that you will find some of the key differences in the rules of different games, along with how these affect the way you play. Finally, you will find some information on the latest way to play Video Poker – at online casinos. The central concept of this game is simple, you are aiming to make a poker hand which has a payout as advised on that particular game’s pay table. This can range from a pair right through to a Royal Flush, with bigger payouts for the harder poker hands to hit. In a basic game you are dealt 5 cards after deciding how many coins to play for (more on that below). You then decide which of your cards to keep, and which to ‘draw’. When you draw a card you are discarding one card and swapping it for another. Most of your decisions will be simple in this game. For example if you have 3 aces, a two and an eight, then you would keep the aces by hitting the ‘Hold’ button next to each of these cards, then draw by hitting the deal button again. The two and eight then get swapped, in this case you are hoping to hit the 4th ace, or maybe a full-house if your 2 new cards make a pair. Some decisions are trickier, you might have 4-cards to a straight, and also a pair. Which you hold will depend on the game payouts, compared to the probability of making the better hand. You will not lose too much by taking the cautious approach and keeping the pair. Over the long-run your payouts will normally be better if you go for the bigger hands. If you are dealt a great 5-card hand, then you can hold them all – this is known as a ‘Pat’ hand, and can be a straight, flush, full house or even a straight flush. The deal and the draw is all there is to this game – though many Video Poker machines will also give you a chance to double up your winnings. The standard way of doing this is to give you a ‘hi-lo’ type game after you win. This is optional, you can simply collect your win and move on to the next hand if you prefer. While the main game variations in Video Poker will not affect your overall game-play, this will make a difference to the cards you hold and the ones you draw. 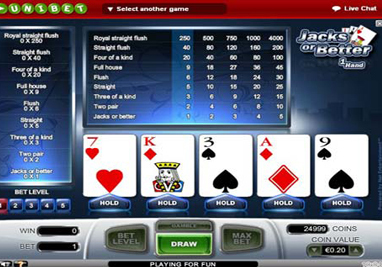 There are some games which are extremely popular, both online and in bars and casinos throughout the country. These include ‘Jacks or Better’ and ‘Deuces Wild’. In Jacks or Better video poker, you only get paid on a pair if this is ranked as a jack or above. Taking the small pairs out of the payout table means that these games can pay a little more for the other hands. Your strategy with a small pair on the initial deal becomes interesting, you might have held this before as a default, now you’ll need to decide whether to try for 3-of-a-kind or 2 pair when faced with the same initial cards. Deuces Wild is just one example of a Video Poker game which includes cards which are ‘Wild’, meaning that they can substitute for any other card, in this case it is the two (Deuce). The other types of machines which include this same idea use Jokers for the wild cards. It is now much easier to make a hand and the pay-table will reflect this. Some games will have separate payouts for a Royal Flush including a wild card and one without. You will normally be given the choice of playing between 1 and 5 coins on any given Video Poker game. Many machines will also let you change the coin amount. For example, you might be able to play 1 coin of 50c or 5 coins of 10c. It is important that you always play the largest available number of coins. This is because of how payout tables are organized on these machines. If you check the biggest wins for 5-coins, these are often much bigger (proportionally) than the payouts for fewer coins. For many new players, this can seem like a small difference. When you go into the math and look at how the casinos house-edge is calculated, you will find that this actually makes a very big difference. Fortunately, Video Poker is one of the lowest house-edge games in any casino, a great reason to learn the Video Poker rules and get playing soon.